It’s hard to imagine the Late Latin name Columba taking off as a boy’s name circa 2008. But with a bit of modification, that just might happen in the US – and has already happened in the UK. Thanks to Unknown for suggesting today’s Name of the Day: Callum. Early saints’ names are often recorded in multiple versions – the Latin, the vernacular, the variant spellings common to their time. Columba is no exception. He’s listed as Columbanus, Columba and Columb, and is credited with bringing Christianity to Scotland. A second saint by the same riddle of appellations brought Celtic monastic practices to Italy and France. A trio of female saints were also called Columba, one living in Cornwall in the same century as her masculine counterparts. The name means dove, and today is worn by a constellation and a type of pigeon. Columba appears to have been used for sons and daughters in about equal measure through the early Middle Ages, but the Celtic variants with the longest staying power are all boy: Colm and Callum, with Columb and Calum popping up from time to time, too. But it’s Callum that has been white hot in the UK in recent years. He’s ranked in the Top 25 for the past five years, peaking at #13 in 2006. But stateside, he’s never even cracked the Top 1000. While the pronunciation is straightforward – KAL um – some parents report hearing “column” or “Calvin” instead. The similarity to callus and callous probably doesn’t help. 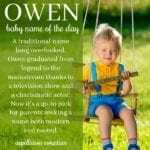 It’s an ideal choice for parents seeking something simple and nickname-proof that fits with Celtic charmers like Aiden, Liam and Connor, but is far less frequently heard. Callum also offers a distinctive twist on the ends-in-en, two-syllable trend in boys’ names – fresh, and yet completely current. Recently I’ve been hearing the name Callan which sounds very similar to Callum but not related to it. I think I prefer the sound of Callan, while Callum seems to have a more substantial background as a given name. My name’s Callum. I live in Sydney and it’s pretty rare to meet another one. I love my name it’s uncommon without being strange. My brother’s name is Calum! It has just one L, which my mom regrets doing still almost 16 years later. I can’t remember off hand where she heard it. I like Callum, and I’d be thrilled to meet one, but I prefer Columbia for a girl and Calvin for a boy. I’ve liked Callum for a long time, and think Cal is sweet and a little quirky. On the girls’ side, the French Colombe has my heart, and I wish Colombine were still usable. I adore Callum. He’s handsome, strong and obviously Irish without being unpronouncable. I know of two under two living in the Boston area, so I’d wager it will be getting more popular within the next 10 years. Callum’s awesome. I adore Callum. I found it when I was looking for an alternative to Aidan, Liam and Connor, exactly the names you’ve listed. My friend loved those names, but she found them way too popular. I suggested Callum since it’s just as short and sweet. […] Callum was Name of the Day back on July 13.